Across the globe, there are about 10 million women-owned small and medium enterprises (SMEs) in the formal business sector, which represent approximately 30% of all SMEs in emerging markets. 70% of these women-owned SMEs report being unbanked or underbanked, which translates to a roughly $300 billion market opportunity for financial service providers. 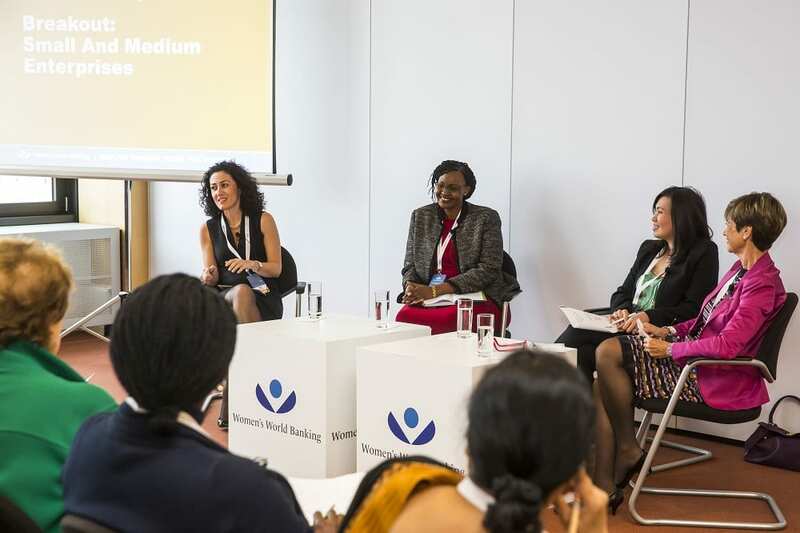 These statistics were quoted by Angela Lumanau of International Finance Corporation (IFC), who spoke on a panel at Women’s World Banking’s Making Finance Work for Women Summit, held in Berlin, Germany this past November. She was joined by Simla Unal of Turkish Economy Bank (TEB), Annastacia Kimtai of Kenya Commercial Bank (KCB) and moderator Christine Bogdanowicz-Bindert. It was fascinating to hear the experiences of these women and their respective institutions in providing financial services tailored to meet the specific needs of women and women-owned enterprises. As someone who works on the finance team at Women’s World Banking, I loved Angela’s statistics, which she presented with the tidy mnemonic “10-30-70-300.” I heard other indicators, too, such as how women business owners repay loans at a similarly high rate to men despite receiving loans that are 25% smaller in aggregate, have shorter repayment cycles, and require interest rates that are on average 0.7 percentage points higher than those offered to men. [i] These data points resonated with me; they reinforced my understanding of the financial access gap for women-led SMEs while underscoring the tangible opportunity for financial service providers to fill that gap. I found myself nodding along as the panelists spoke “my language,” using hard numbers and data-based evidence to further prove the business case for serving women. Women’s World Banking’s own research into global best practices in banking women-owned SMEs has confirmed that gender-disaggregated data is essential for financial institutions seeking to serve this segment effectively. Before I became too fixated on the power of this data, Annastacia reminded the audience (I should say, me) that we cannot simply use “loans disbursed,” “accounts opened” or other statistics as widgets representing financial inclusion. In order to successfully meet the needs of women-owned SMEs in particular, upscaling – growing the business into a commercial, profitable enterprise – is key. To get there, financial institutions must invest in women from a holistic perspective and offer a suite of financial and non-financial services to meet their complex needs and constraints. This type of women-focused SME banking proposition could include business loans, savings accounts, job skills training, mentoring, and more. As with any investment, reaching the break-even point requires time, monetary and human resources, and persistence. What the panel made clear, however, is that the potential return on investment (ROI) for serving this segment is huge from both a financial and societal perspective: developing services to complement the financial offering of an institution can contribute to increased revenue and client projections, as well as facilitate a positive cycle of growth for women as they grow their businesses and gain greater participation in the markets. Finally, while the numbers provide a compelling rationale for banking women-owned SMEs, it is also important to remember that some valuable outcomes – like the confidence a business owner feels as she expands her business – cannot be measured.